Find yourself in America's old west when you walk through these gates. Tied closely to the theming of Liberty Square the two lands combine to provide a near seamless experience. Two of the park's "E-ticket" attractions are found in Frontierland in Big Thunder Mountain Railroad, a roller coaster, and Splash Mountain, on of the world's tallest flume drops. The rest of the area projects a more relaxed feel and shaded areas on the Rivers of America create great spots to take a break from the rush to see everything. Location: West side of the park, above Adventureland; can only be accessed through Adventureland or Liberty Square. Big Thunder Mountain Railroad A thrilling ride on a runaway mine train. Country Bear Jamboree An animatronic muscial revue. Splash Mountain A combination of a classic flume ride with Disney showmanship. Tom Sawyer Island A giant old west playground for kids and wannabe kids. Frontierland Shootin' Arcade One of the few additional fee attractions, get some target practice in. Woody's Cowboy Camp Learn from some of the Toy Story characters what it takes to be a cowboy. Golden Oak Outpost A quick stop for food on-the-go at the backside of Frontierland. 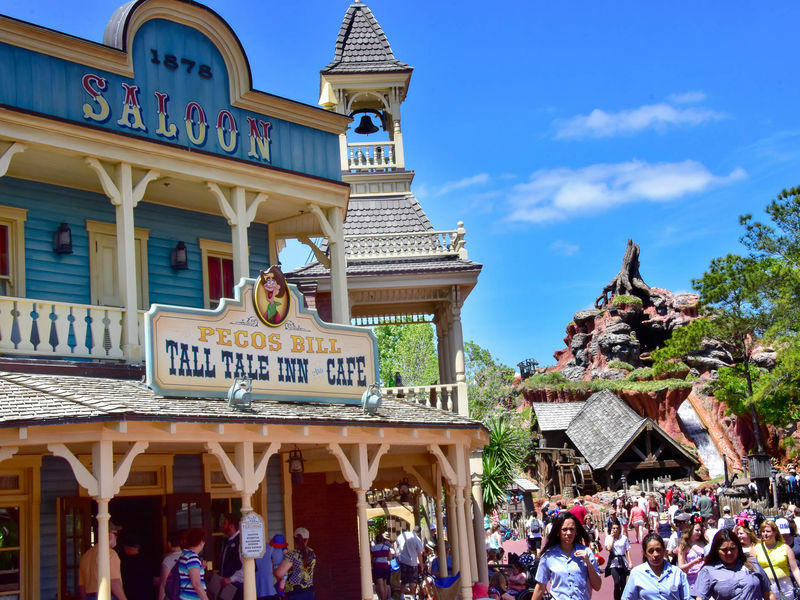 Pecos Bill Tall Tale Inn & Caf� TexMex fare in a Western-themed saloon. Westward Ho Refreshments Corn dogs, chips and drinks. Briar Patch Winnie the Pooh merchandise. Frontierland Trading Post Western clothing such as well as novelty items like Indian headdresses. At this location: Frontierland has expanded a bit over the years as Splash Mountain and Big Thunder Mountain Railroad were built in prevoiusly empty areas. The Land's History: Frontierland opened in 1971 as a much more low key area, and most of what was in the land at that time is now gone; Country Bear Jamboree is the only original attraction left. Without any thrill rides in 1971, the focus was very much on Rivers of America. The Mike Fink Keel Boats (based on boats seen in two of the Davy Crockett television movies)survived until 1995. Also circling Rivers of America were Davy Crockett's Explorer Canoes, which operated seasonally and just kind of faded away at some point. The land also opened with entertainment and food in the Diamond Horseshoe Review which was replaced by Goofy's Country Dancin' Jamboree in January 2003, a show that lasted only a year before the entire location closed. 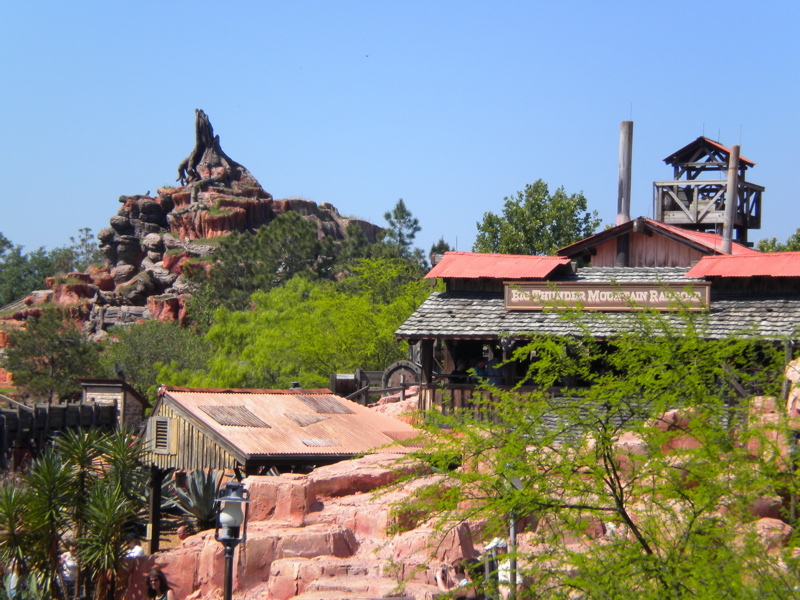 1980 saw the first significant expansion of Frontierland with the opening of Big Thounder Mountain Railroad and the utilization of the surrounding area. In 1992, the area received another boost with the introduction of Splash Mountain.